Starting with Enterprise Manager (EM) 12c, you have the choice to send SMS notifications to a cell phone, or a pager (does anybody still use pagers?). There’s been a couple questions on the forums about this so I thought I’d write it up since it appears to be a bit confusing as to how this works. 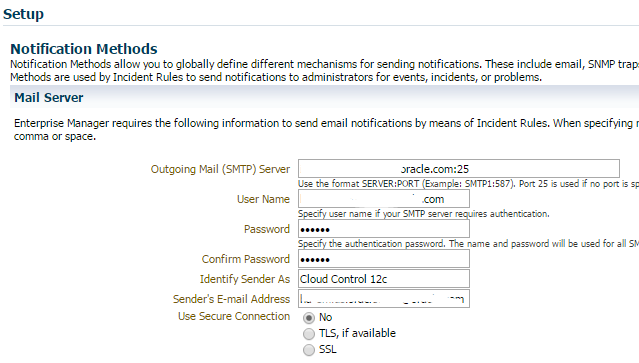 First, be sure that your Mail Server is setup in Setup / Notifications / Notification Methods and you can receive the test e-mail. 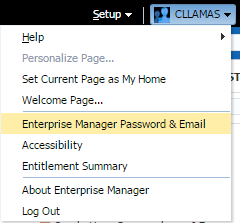 Next, create an EM administrator user, then login as that user to update your e-mail address and SMS/Pager information by clicking on the Username drop down menu and selecting Enterprise Manager Password & Email. 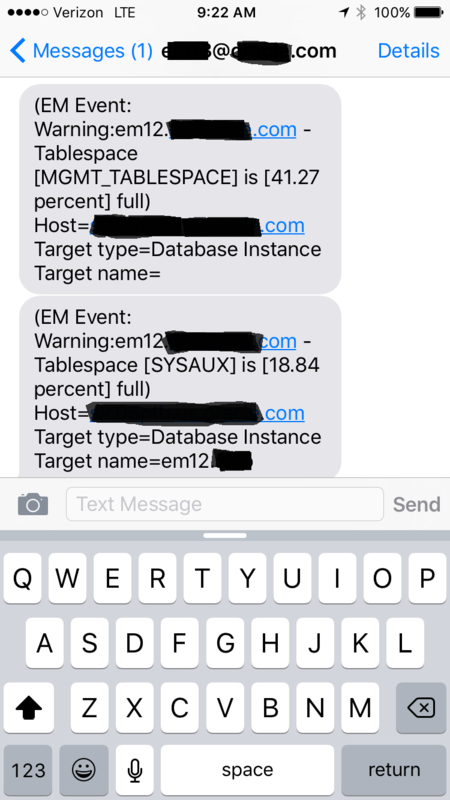 For the SMS/Pager, you need the text based address. So if your provider was Verizon, it would be 8885555555@vtext.com. 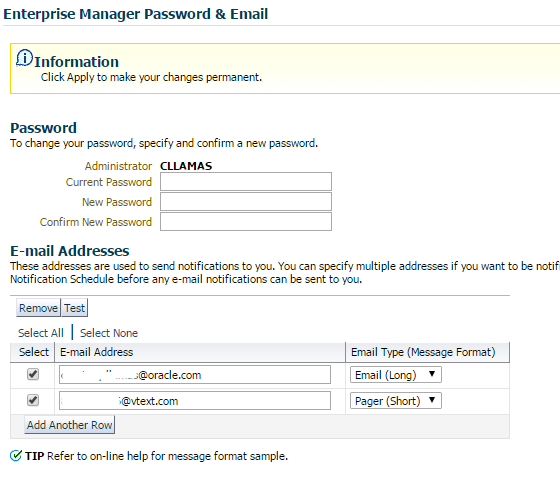 Select the Email Type Pager for SMS messages as they are shorter than the Email format. It’s important to note, that you will not see the multiple lines in the Setup / Security / Administrators view. You can enter multiple e-mails separated by commas, but the E-mail Type option will not be available. By default, both email and pager will be enabled in your Notification Schedule, you may adjust this as necessary by going to Setup / Notifications / My Notification Schedule. You can receive notifications by both e-mail/page, just e-mail, or just page depending on what you configure here. 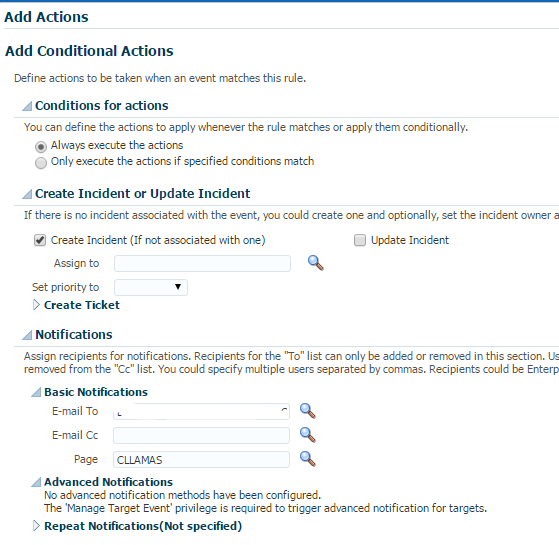 Next, you need to create an Incident Rule Set, or edit an existing one. From Setup / Incidents / Incident Rules, select a rule set and rule to edit. Once you get to the Action for the Rule, in the Basic Notifications section, select the EM Administrator in the Page box. Save all changes. In 12cR4, you can test the Incident Rule Set by selecting your Rule Set and clicking the Simulate Rules button (Setup / Incidents / Incident Rules). You will need to select a Target, Event Type and find an alert to simulate. Then you will get a list of Actions that the Incident Rule Set will perform for this alert. To test my notifications, I dropped the warning threshold on the tablespace metric to 15, something I know would trigger immediately. Here’s the messages I received on my phone. I also received the long format in my e-mail. When you’re done testing, don’t forget to set your thresholds back! You might have heard by now, there’s this little meeting coming up in 9 days called Oracle Open World. If you happen to be heading to San Francisco, drop by and see a few friends, or 50,000. Be sure to register for my session! This year will be a little different as I’ll be running a panel with 4 Enterprise Manager Champions! In this panel discussion, customers share their experiences with Oracle Enterprise Manager Cloud Control and discuss how they’ve implemented features leading to significant cost savings and operational efficiency. Get started with deployment and management of agents and establishing initial thresholds for alerting. Simplify administration of users with active directory integration. Maintain security standards and increased productivity by patching fleets of databases and stay current with critical patch updates. 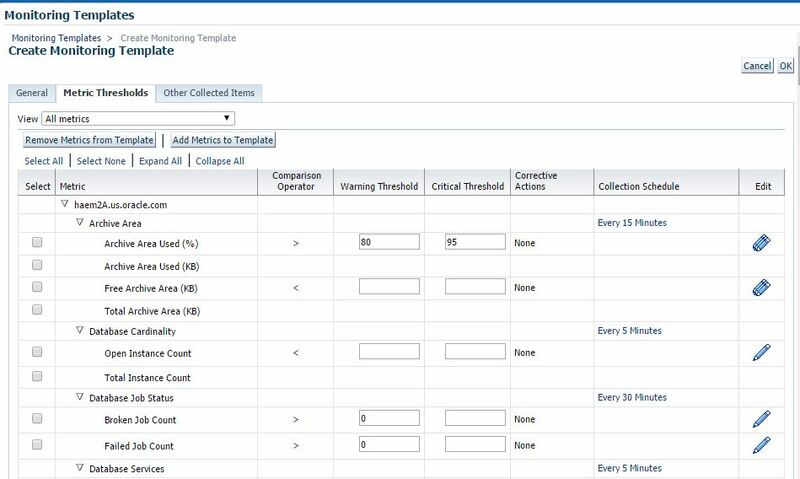 Learn from customers how they’ve made use of out-of-the-box and custom reports to manage engineered systems, database, and middleware targets by exception. Benefit from these top customer dos and don’ts. When not presenting or meeting with customers, you’ll find me at the Engineered Systems Showcase or Hybrid Cloud Management: Single Pane of Glass for Complete Management—On-Premises and Public Cloud (SLD-026) booths. Be sure to stop by and say hi! For the full list of EM related sessions, you can refer to the Focus On docs. Here’s some highlights of other sessions you’ll find interesting! For those of you who arrive on on Saturday, or early Sunday… and aren’t drawn away by the beautiful city of San Francisco, check out the IOUG SIG Sunday sessions that are going on all day Sunday! Watch out, they’re no longer restricted to Moscone West rooms! Here’s a few I’m going to try to get to! Hear from Amit Ganesh, VP of Development for EM. Hear about how the Oracle Cloud relies on Oracle Enterprise Manager, and learn best practices for any implementation! 5-6pm – Join your fellow EM enthusiasts in the OTN Lounge (Moscone South) for the IOUG EM SIG. Don’t worry if you’re not a member yet, stop by and get to know some of the folks you see on Twitter or hear speaking! Definitely a must attend event! Learn about Oracle’s newest offering Oracle Management Cloud. After my session at 11am, there’s a lot going on at 12:15pm but if you’re interested in monitoring, I’d recommend Way Beyond the Basics: Oracle Enterprise Manager Monitoring Best Practices [CON9721] in Moscone South 300. 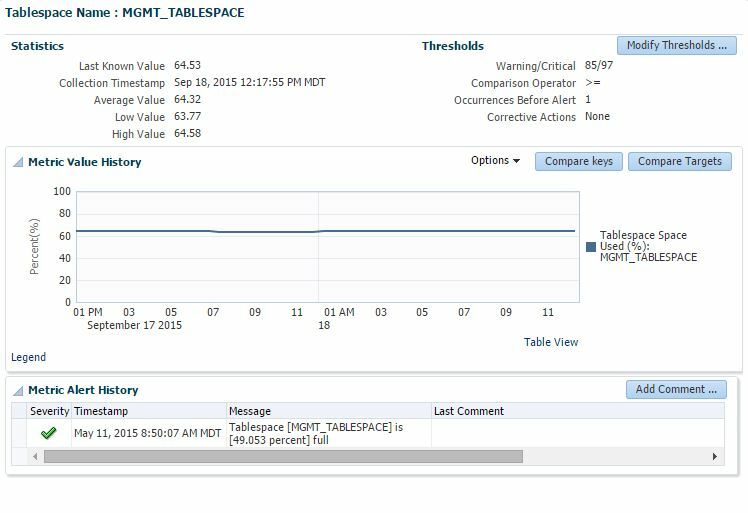 Enterprise Manager is a critical tool for monitoring database and middleware targets, as well as Engineered Systems and hosts. Each target has it’s own set of metrics. If you read my previous posts on viewing metrics and setting thresholds, you’ve got a good understanding of how to set thresholds on a single target. What if you have 100 targets? Or a 1000? Your targets for production may even have different thresholds then non-production. Do you really want to manually set these metrics up on all targets? Not likely. 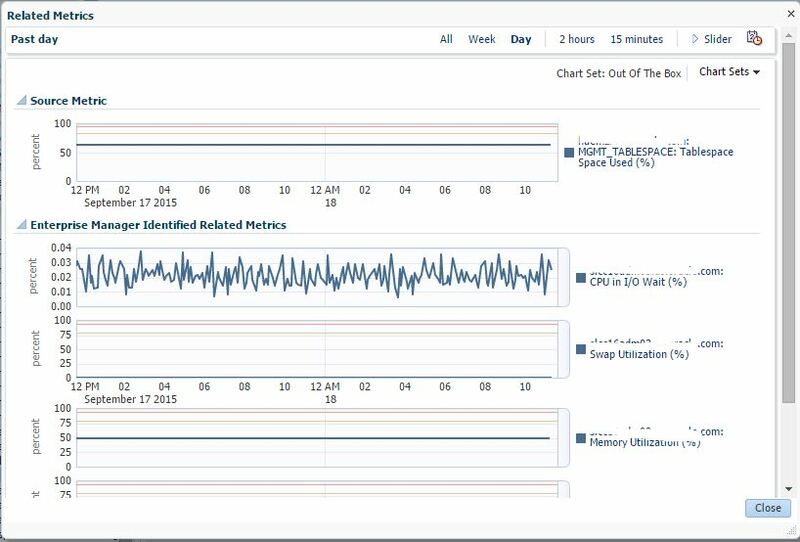 If you have more than 3 databases or targets, you should probably consider standardizing your monitoring by using Monitoring Templates. Templates allow you to reuse the metrics you’ve defined for like targets. 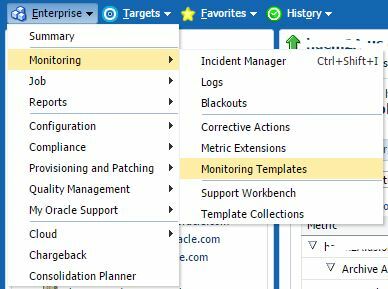 From Enterprise menu, select Monitoring / Monitoring Templates. 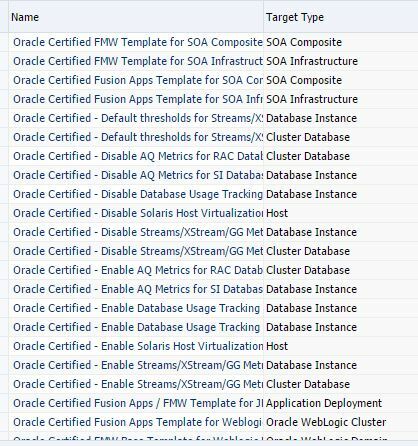 You can see in the search box, you can display Oracle Certified templates. If you check this, you’ll find a long list of templates for various midddleware and application situations. The first method to create a template is based on an existing target. This allows you to configure your monitoring on one sample target, and copy this to a template. Click Create. Notice the copy monitoring settings from Target is selected. Click the search icon to find the sample target you want to copy metrics from and click Select. First we need to give our template a name. If you’re going to have multiple templates, it’s best to give them a detailed name to make them distinct and easily identified. 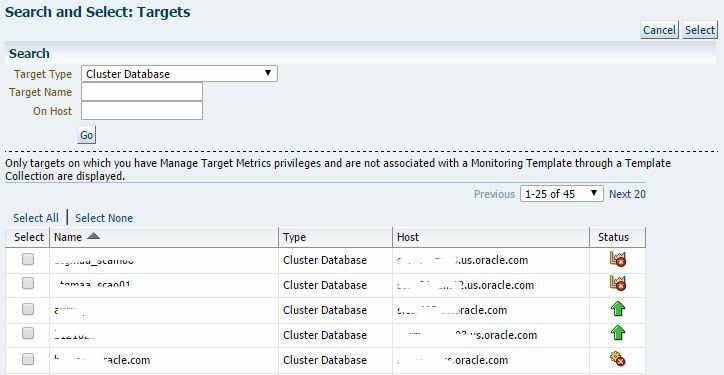 Notice the Default Template checkbox – if you check this, this template will be automatically applied to all new (not existing) Cluster Database targets as they are discovered in Enterprise Manager. Only one default template per target type can be identified. Click on Metric Thresholds and you will see a familiar screen with the target metrics and Warning and Critical thresholds. If there’s additional metrics you want to add, or maybe remove from this template, click the Remove or Add metrics button. When adding metrics, you’ll be able to search for another target, template or metric extension that you wish to add to this template. When you’ve made your adjustments, click on the OK button to save your template. You’ll get a confirmation when your template is created. From Monitoring Templates, click Create, this time select the option for Target Type. 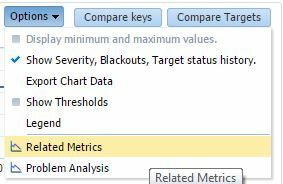 This option will pull the default registered metrics for that particular target type. Next you’ll select a category and the target type. For Database, we will select Database Instance. From here, the process is the same. This template will have all default recommended metrics and you can make your adjustments from here. Now that you have a new template, you can select this template and click Apply to apply to any existing targets. The Apply Options are important to consider. By default, templates override only metrics common to template and target. This means if there’s a metric on the target, that is not included in the template, it is not removed or replaced. If the metric has different thresholds or no thresholds, then it is updated to match the template. The top option, to completely replace settings on the target will make the target identical to the target. Which means if there are metrics not in the template, the apply will remove thresholds for those metrics and no longer alert. 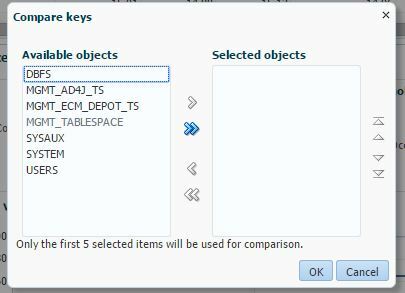 The Key Values section tells the template apply how you want to handle those metrics such as Tablespace that might have multiple key values, say different thresholds for SYSTEM and SYSAUX tablespaces. Click Add to select the targets or group you would like to apply the template to, and click Select. Then click OK to submit the Apply job. 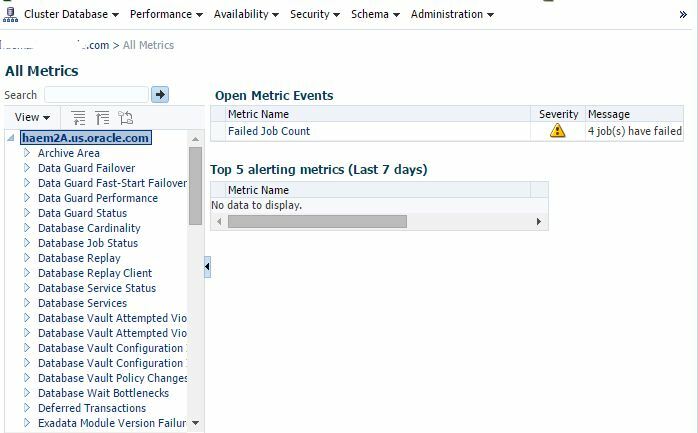 You can view the apply status from the Past Apply Operations button and get information on succeeded and failed operations. So now you can take some time up front, standardize your metrics, and enforce them with templates. Dive deeper into the areas that interest you! All steps can be done on your lab box or on your own Enterprise Manager system. One of the most critical steps in monitoring your targets with Enterprise Manager, is to set your metrics and thresholds properly for your environment. 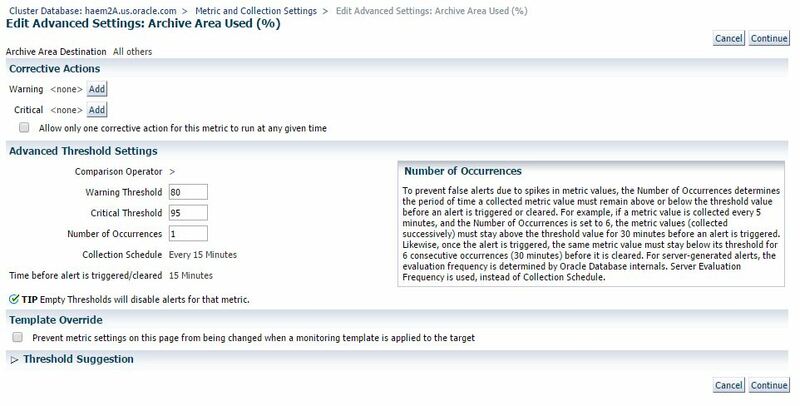 All targets will have predefined metrics that will be enabled and thresholds set based on recommendations from Oracle product teams. These may or may not be good for your environment. Customers all have different requirements for what they want to be e-mailed, paged or notified by ticket about. The most common metrics for databases are going to be the ones that cause service outages: availability, space issues, archiver issues, data guard gaps, critical ORA- errors. Some things, you just don’t need to know about at 2am though, things like global cache blocks lost. From the target menu, select Monitoring / Metric and Collection Settings. This will show you the current settings of your target. Notice the default view is Metrics with Thresholds. Other items are collected and can be seeing in the All Metrics view. Let’s take a closer look at what we see here. First we have the metric grouping or category. Then for each metric in the group, you’ll have the operator, warning and critical thresholds. These are the most important. If you don’t provide a value, alerts will not be triggered as there will be no threshold violations. 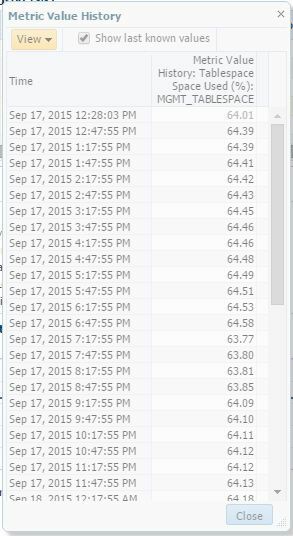 The next column displays if a corrective action job has been registered on this metric. Followed by the collection schedule and Edit icon. Clicking on the link in Collection Schedule will bring you to the collection settings. 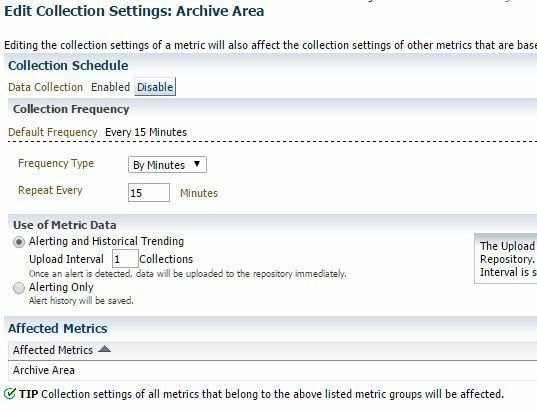 You can enable or disable a metric collection, change the frequency, and determine whether alert only or historical trending data will be saved. 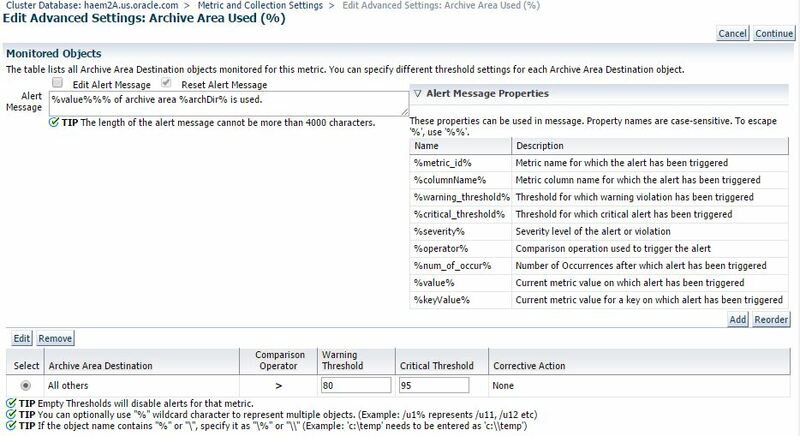 If you select alert only, it will only store occurrences where thresholds are violated. 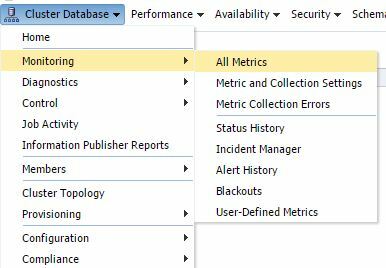 Pay careful attention to the Affected Metrics section, as some metrics are collected in a group, and modifying these settings will affect all metrics in that group. Returning to the main screen, click on the pencil icon to edit the metric. This first section is where you can add a Corrective Action job if you want to automatically fix your alerts. An example would be kicking off a RMAN archive log backup job when Archive Area Used % event is triggered. In the Advanced Threshold section, you can determine how many times a threshold must be exceeded in a row to trigger an alert. 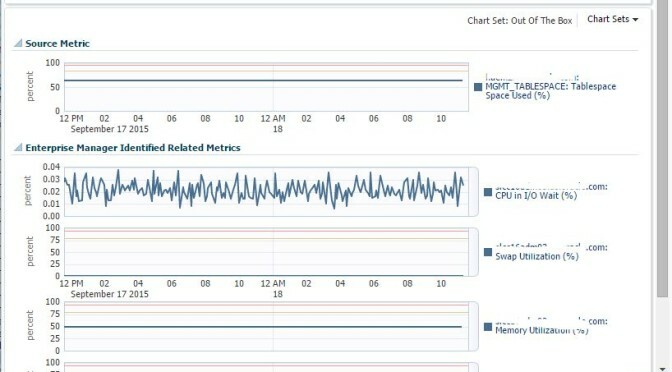 So if you want to alert if CPU is 95% for over 3 collections (15 minutes), then you would set Number of Occurrences to 3. Template override allows an administrator to prevent a particular metric from being changed when templates are applied. You want to avoid this as a common practice and reserve for special exceptions. The Threshold Suggestion section allows you to evaluate what warning and critical severity alerts would be generated if you changed thresholds. You can look at the last month of collected metrics to make the best threshold estimates. If your metric has multiple keys, you will have an additional screen where you can add additional keys. A key would be a filesystem, or a tablespace that you want to monitor with different thresholds then the rest. Whey you’re finished making changes, clicking Continue and OK to save metric changes to the repository and push out to the Agent. Once you get a target set up for monitoring the way you want, you can create a template to push the same settings to all like targets. I’ll cover this in another post soon!